ItemI-81014 - Mr. and Mrs. Myrick's daughter. ItemB-00380 - George Street, Prince George. 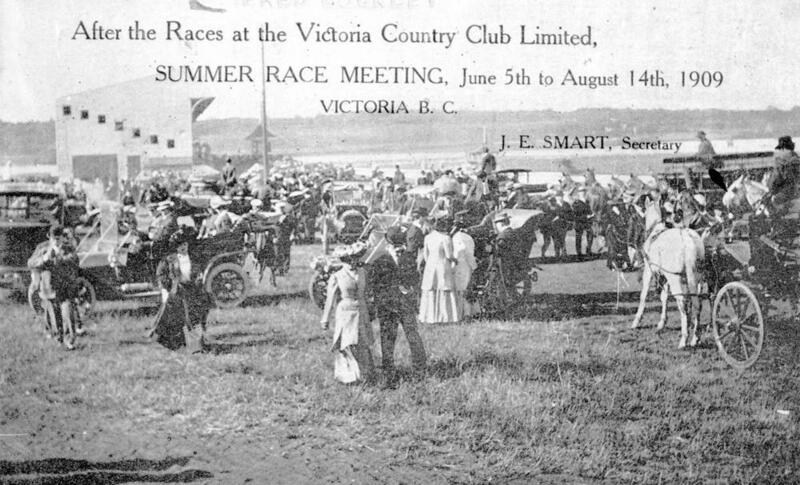 ItemB-00485 - "After the races at the Victoria Country Club Limited, Summer Race Meeting, June 5th to August 1st, 1909, Victoria BC; J.E. Smart, Secretary." ItemB-00494 - Mount Pleasant School, near junction of Westminster Road and 9th Avenue; Florence Morrison, teacher. ItemB-00479 - The SS Alexander moored to ice at Cape Prince of Wales. ItemB-00481 - "Steamer Tutshi at Carcross". ItemB-00487 - "Golden Gate from Telegraph Hill San Francisco." Item B-00485 - "After the races at the Victoria Country Club Limited, Summer Race Meeting, June 5th to August 1st, 1909, Victoria BC; J.E. Smart, Secretary."